LED wall spotlight, easy to mount and available in both 18 and 36 Watt. These lights are a bit of a complement to our rails plant lights and E27 lamps, as they are more powerful than our E27 spotlight and fulfills the function as spotlight instead of giving an elongated light pattern as the rails do. Our spotlight plant lighting is perfect if for example you want to give extra light to a single large plants or tree. Just as our rails these are also available in two different version, one smaller and one larger. The spotlights are easily mounted on the wall using the supplied brackets. The spotlight will take up less space than our rails and can after suspension be tilted on its axis 360 degrees and swiveled 180 in order to direct the light where it is needed. These spotlights, as our other plant lights are equipped with Gemma LEDs optimized and spectrum. The spectrum gives a nice atmosphere and is particularly suitable to be hung indoors where the requirements for feel-good factor is high. As our other smaller plant lights this is also built using passive cooling, without any fans buzzing or other moving parts that makes noise. The lighting is completely silent in operation, a requirement for those who want to hang lights indoors. 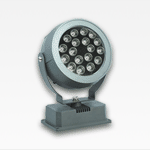 As our other larger plant lights these are also those suitable for both indoor and outdoor use. Instead of active cooling that requires fans to keep diodes temperate our spotlights use passive cooling. This means that instead of having fans carrying heat away, these grow lights use a sturdy metal shell that acts as a heatsink. Thanks to this, the plant lighting is completely silent and can therefore be hung in any environment where comfort is a factor. In addition to the passive cooling these grow spotlights are also IP65 rated which means that the light can be exposed to moisture and rain, and thus be hung indoors as well as outdoors.